Homes across the united states are installing wind power home appliances. Like the couple in California in this video below. 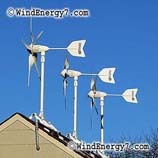 People are cutting their electrical bills by using clean wind power home appliances. Of course unlike the guy in this video, if you get a more economically designed system from WindEnergy7.com your cost is 1/2 to maybe 1/3 of cost of some of these other systems. With our systems, the units pay for themselves with or without government subsidies. If you have wind resources over a zone 2, your wind system will make economical sense, paying for itself in 7 to 10 years, depending on your local situation and how large of a system you want to put in. We have done ROI studies in zone 3 to 4 that show a 5 year payback on the investment. A zone 2 is most likely 7 to 10 year payback on the investment. BUT, the system is designed to go 25 to 30 years without a rebuild. Our wind power home appliances start around $2,500 and can go as large and complex as you wish. We make sure that every customer is satisfied and the system is working for their needs. 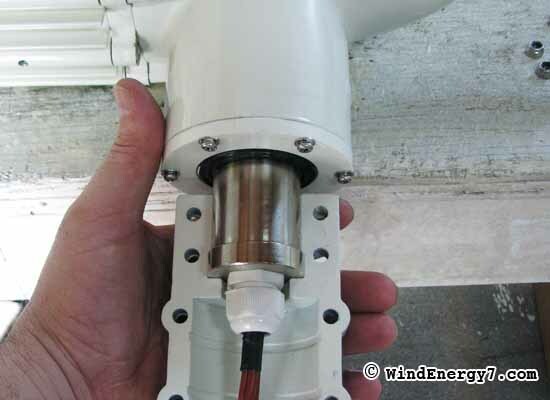 Our wind turbines all have slip ring design. Many other turbines don’t have slip ring design, the connection cable will get twisted as the wind shifts direction and requiring constant untangling. Tangled wires can be damaged and connections can be lost with potentially disastrous consequences. Our Slip Ring design is the elegant solution to this problem. 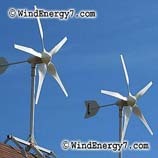 Like all other problems, you don’t have them with WindEnergy7.com turbines. 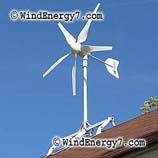 WindEnergy7.com has reliable, Innovative two moving part design with 25-year maintenance-free generator life span. Can be used as either wind turbine only or wind/solar hybrid system. Integrated wind and solar power sources to capture the most energy in all conditions. Our turbines all have very durable rotor blades. Excellent workmanship, stainless steel parts, with high strength aluminum die cast generator housing. These home wind power appliances are designed for various working conditions. Our turbines designed for severe climate, sand and salt corrosive environments and marine usage. We use strong Neodymium magnet PMA, the unique winding and multi pole design reduces the start-up torque of the alternator that assures the it can generate more electricity at low wind speed than other systems. Our turbine is 400 rpm, starts charging at under 6 mph. This unit comes with connection to easily plug-in a solar panel with plug-n-play ease. You can use this residential turbine as a hybrid wind/solar system which will give more consistent power. Wind is strongest in winter months, Sun/Solar is strongest in summer months. Using our hybrid wind/solar home systems will give you more consistent power for your residence. This starter small turbine is incredible, tested to sustain 134 mph survival speed, system operates and generate electricity up to 134 mph. The advanced speed limitation design uses electromagnetic speed limitation supplemented by aerodynamic speed limitation by blade deformation. Combination of Electromagnetic braking and aerodynamic braking maximizes energy capture by extending turbine’s operating speed range into higher speed winds and lower speed winds. Email us. We sell well designed, high tech systems, not just parts, plans, ideas. I could write a book on the research and design technology that goes into a little turbine like this one that WindEnergy7 sells. Our turbines are state of the art and the best there is.